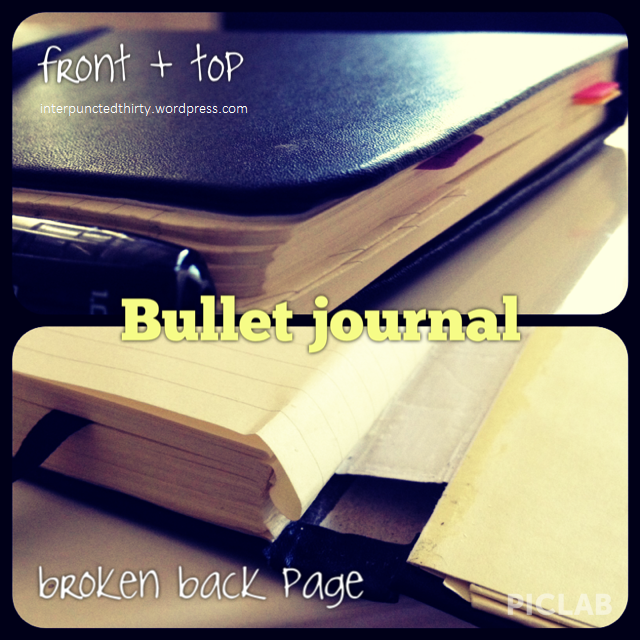 To continue with the nerd-out, I’m posting how I use my bullet journal system. I’ve had this sucker for a few months now. It’s a Piccadilly notebook that I bought at Woolworths awhile back. My verdict: well, it fell apart about two weeks into my using it; however, in its defense, I was using it heavily every day. Anyhoo, I keep it very simple – 3 coloured tags for super important information, bookmarked for groups of important pages for immediate reference that day or week, and a pen attached to it. 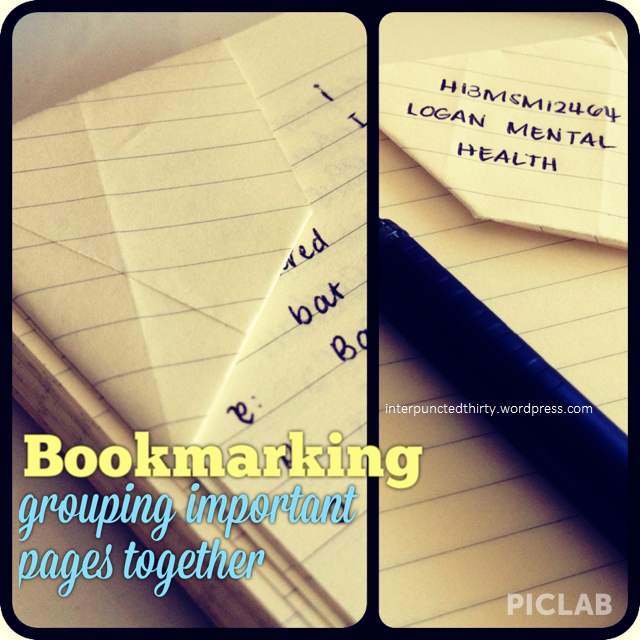 For a group of important pages, I use an origami bookmark and write what it is on the front. This might be some thoughts or ideas about job applications, or blog ideas, or drafts for assignments. I use it when I need to refer to something as part of a task I have to complete. Below is an example of how I use the bookmarking tool. I mentioned in the last organisation/planning post, that I sometimes use Chronodex print-outs to plan for hourly parts of my day. I used this system when it first came out, and as much as I’m a fan of mind-mapping, I found that I was also missing important tasks/events because I’d overlook it. It is, however, good for planning my appointments for work and for writing down the flow of my day. To be honest, it got a bit annoying at the end having to print them out and stick them on every day. 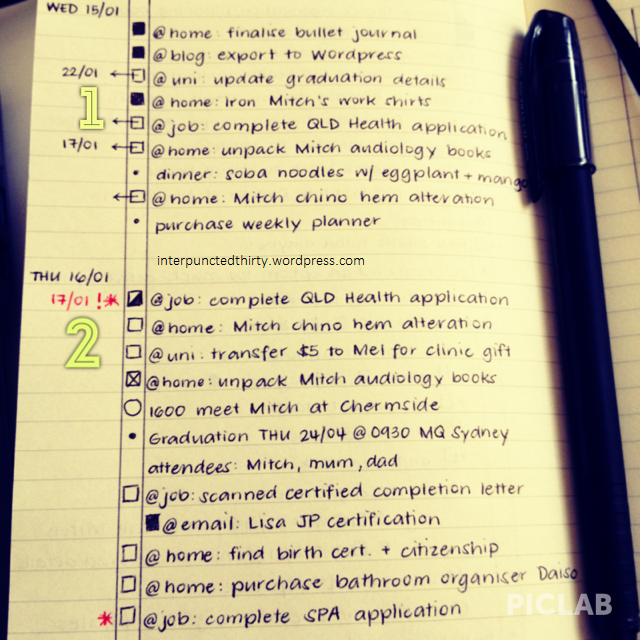 I’m considering using the traditional vertical block-out system like the Moleskine daily planner pages. Nonetheless, this is a picture of one of my pages. Can you see how it can get a bit hectic and frenzied? And lastly, the bullets in the bullet journal system itself… I use the squares for tasks and circles for events, and solid bullet points for notes/thoughts/ideas. Before that though, I set up the ruled pages with a double margin to keep it semi-structured. I must say, I prefer the grid paper, but I had to improvise somehow. In number 1 in the picture, the blocked out square means ‘complete’, and the arrow in the box is a ‘migrated’ task. I took this a step further and added a date in the margin next to the arrow if it’s not a task that needs to be or can’t be done the following day. 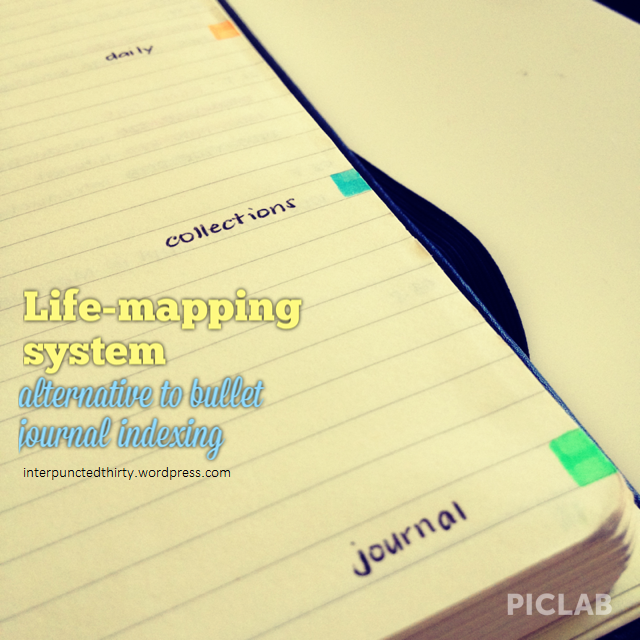 I use the star and exclamation mark the same way that the bullet journal system does. In number 2 in the picture, the half coloured task box means ‘incomplete’ or ‘in progress’, and the ‘x’ mark means ‘cancelled’ or ‘deleted’. I use the contexts ‘@’ from the GTD system when I write my tasks, and then if there’s a few of them that needs to be done that day or week, I make them into a collection, as per bullet journal. And that’s it. That’s how I use several systems in one. Feel free to ask questions, leave a comment or make suggestions in the comments section below. Welcome back! I’m loving the blog. Also, I see my name. It’s happening. Tomorrow I am back in the office properly and can promise it will happen. I am slack. Sorry. What is the pen in these pictures? Your handwriting is amazing! Thanks, Kim :) the pen is a Uniball Jetstream 101 1.0 nib. They’re about $2.00 in Australia. Hi Melody, thanks for the nice words :) all good sharing it with the G+ community. I’m part of that group too. Have a great day! I really like this system. Question though,What do you do with your migrated tasks? Do you have future pages already made up, or do you transfer them when you get to that date? Great post. I am pinning this to come back and study 😀 I’ve recently started using a vey basic bullet system and am liking it enough to incorporate more systematic approach.